Ambur is a complete point of sale (POS) system without all the extra baggage. We'll be your righthand man, helping to set up your menu, your wireless network and all other features of Ambur. After a couple weeks, you'll feel like a master. Free support for life! 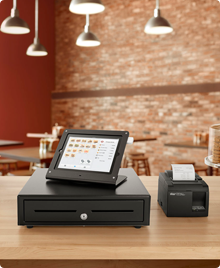 Ambur is a PCI compliant iPad POS solution, with all card data being encrypted by the reader. Transactions are routed to your processor via a secure gateway. Fees for gateway vary by processor. Process credit card payments on an iPad, iPad mini, iPod or an iPhone. We are compatible with the Magtek, iDynamo and uDynamo readers. A direct integration with Dropbox automatically backs up all your data every hour, which can then be retrieved from any iOS device with a few taps. Even better, it doesn't cost you a dime!